In Gene Roddenberry’s Star Trek TV shows and movies and George Lucas’s Star Wars films, we saw one version of futuristic style. They offered us future fashions that were sleek, clean, bold, and colorful. Picture Captain Kirk’s gold and black V-neck and Princess Leia’s pristine white gown. 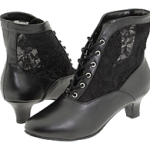 Even Han Solo, that scoundrel, had shiny black boots and fresh-looking attire. No holes, patches, or frays on that dashing young smuggler. 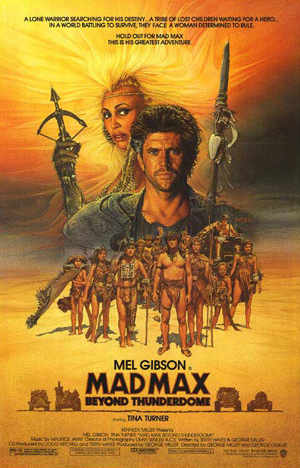 Enter 1979’s Mad Max, followed by 1981’s The Road Warrior and 1985’s Mad Max Beyond Thunderdome. These wildly popular movies made a star of Mel Gibson and introduced younger moviegoers to that beautiful badass, Tina Turner. As opposed to the futures imagined by Roddenberry and Lucas, in which a noble core of democracy exists to counteract lawlessness, and laundry facilities are plentiful, Mad Maxshowed us a dog-eat-dog, gritty sort of world. We hadn’t gone off boldly in search of new adventures. We weren’t cruising around in gleaming, roomy spaceships. Instead, some sort of apocalypse had killed off all the tree huggers and literary types, leaving grizzled, bitter, and violent biker dudes to roam freely. It was a tough scene. The vehicles of Mad Max were nutso. Tanks, motorcycles, dune buggies, trucks, and cars tricked out with weaponry and custom bits of flair. Bizarre hybrid armored rides with handy gun turrets. The scene in the Thunderdome body shops must have been intense for those dudes. I picture them drinking, like, moonshine made from antifreeze and knocking each other’s teeth out in between careful soldering jobs and engine enhancement. The rides were labor-intensive, weird, intimidating, and way cool. 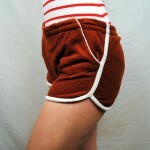 The fashions they wore were, of course, equally tough. 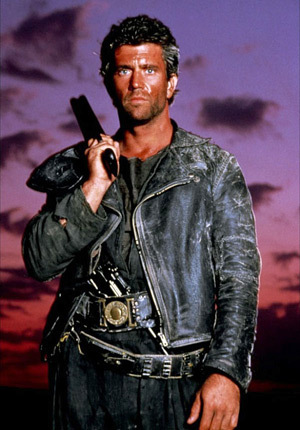 Mad Max would have been laughed right out of the Thunderdome if he’d shown up in one of Luke Skywalker’s beige tunics or Kirk’s tight mustard tops. Nuh-uh. Instead, think biker gear embellished with choice accessories from the Orc troops of Lord of the Rings. James Dean blended with Sid Vicious and spiced up with some extra piercings, metal mesh, and infrequent bathing. We saw very different post-apocalypse attire in 1999’s The Matrix, where the unplugged denizens sported grubby taupe and gray lounge wear (and, of course, those creepy holes in their heads for Matrix booting-up sessions) and the far bleaker post-apocalypse flick, The Road. These desperate survivors would never take the time to, say, match their enormous spiked earrings to their metal bustier. Residents of Mad Max’s world might be violent and uncultured, but they sure put some consideration into their outfits. 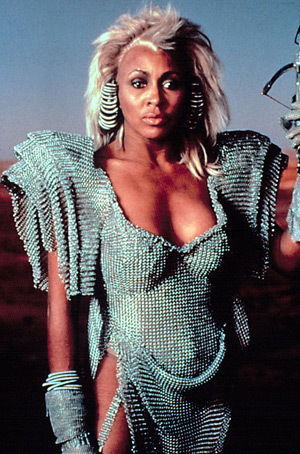 Tina Turner totally wowed us in Mad Max Beyond Thunderdome. In addition to her defiant vocals in the title song and her scandalous slit-to-there hemline, she had enormous shoulder pads, a metal dress, and hair and jewelry that were clearly not just thrown together for a quick trip to the corner market. 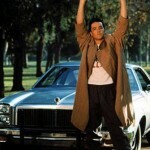 Was she, like, welded into that thing? Scary hot. Speaking of scary, check out this guy (pictured at left). Heh. I love the expression on his biker babe. She’s all, Yeah, baby. I got me the LEADER OF THE PACK. And let’s not forget Mel. This, of course, was pre-scandal Mel. Before we were introduced to WHAT offensive thing did you just say?? Mel, we were way into WHO is this hot Australian guy in black leather? Mel. We had a lot to be scared of in the 1980s. Nuclear war, aids, and the War on Drugs had us one edge. Pollution and over-crowding weren’t helping matters. Maybe we liked to think of ourselves as tough-guy survivors, like Mad Max, instead of genteel Captain Kirks. After all, in the grim future we feared, fierce strength would guarantee our survival more than calm discretion. And, if we couldn’t be as gritty-tough as Mel Gibson’s or Tina Turner’s characters, we could at least dress with a nod to their wild style. 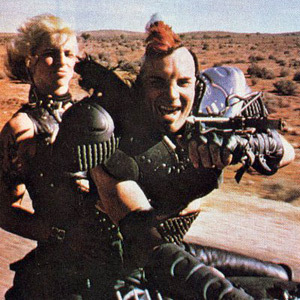 Mad Max took early punk style and upped the ante. I’ll see your black leather biker jacket and Mohawk and raise you feathers, chains, mesh, shoulders-to-there, and war paint. The look was tough, scary, and oddly flattering.